Datuk Mohammad Nor Khalid (Lat) recalled his childhood days back in the 1950s when they were fond of drawing and making sketches of Malay kampung houses during art class at school. THE rumah Melayu is a piece of tangible icon that also evokes the intangibility of the Malay “budi”. The artifact should be gazetted as a national heritage. Recently in January, I gave a talk at the Exhibition on Malay Architecture: The Resilience of Tradition from Origin to the Contemporary at Muzium dan Galeri Tuanku Fauziah, Universiti Sains Malaysia. I spoke on the Rumah Melayu as Embodiment of Expression and Budi in Malay Architecture and suggested that in our discourse at developing Malaysian national architecture, we critically embrace the humble Malay house — rumah Melayu. We occasionally and ritualistically return to our primordial being and origins — to rumah ibu (mother’s house), rumah keluarga (family house), or rumah gadang (the Minangkabau ancestral home). In Penang, one can find pockets of kampung along the Air Itam road leading to Penang Hill (Bukit Bendera) — Kampung Baru, Kampung Tengah and Kampung Melayu. 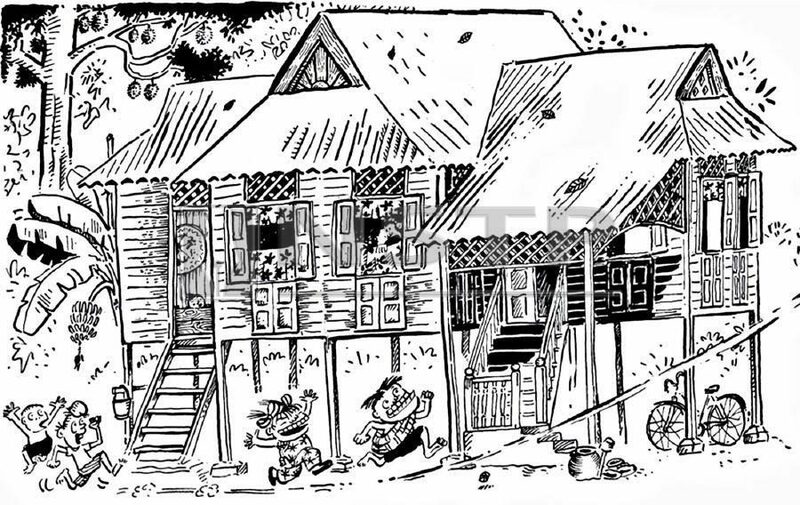 Malay kampung houses were present — in various forms, many of which can be categorised as embodying the Penang Malay architecture (some expressing a Jawi Pekan form) set against a somewhat urban environment. And much of the rumah Melayu can also be found elsewhere, in Balik Pulau and in various parts of Seberang Prai. One also cannot help but consume the sights of the rumah Melayu, especially along the north-south trunk road, along Jasin and Alor Gajah, the Kelumpang-Tanjung Malim stretch, and the Tapah-Gopeng stretch. We see them nestled in well manicured lawns. Many stand proud — evoking an art form of daily life and behaviour. Some are dilapidated, some abandoned for some reason, but still with a glint of their heyday. The rumah Melayu, some in natural timber tones, and some painted in a variety of colours, are gems to see. These precious pieces of architecture are rapidly disappearing. The rumah Melayu is a timber house raised on stilts. It is basically a post and lintel structure with wooden or bamboo walls and a thatched roof. Windows are plentiful, lining the walls and providing good ventilation and views for the house. There are large open interior spaces with minimal partitions. From a distance, the rumah Melayu seems to merge naturally with the environment. According to Lim Jee Yuan (1987:20) in his The Malay House: Rediscovering Malaysia’s Indigenous Shelter System, the roof, which is large, dominates the low walls and the open stilted bottom of the house. The juxtaposition of the roof of the house with different sizes and at different orientations creates an interesting visual form. The rumah Melayu is a clear expression of the way of life and culture of its users. It evokes the budi of its builders and its consumers. In its spaces, we find the essence of the budi, tangible in form. It gravitates towards the built environment. If the budi is the root paradigm in Malay science and knowledge, then the rumah Melayu is the quintessential genesis of tangible Malay knowledge. It evokes the jiwa (soul), rasa (feel) and rupa (form) and the expression of budi in Malay architecture. The rumah Melayu is the conscious and subconscious construction of the Malay worldview — the epitome of an architectural genius. Quite literally like the pantun, it is both medium and message. It is a capsule of the Malay Weltanschauung, encompassing philosophy, thought, reasoning, aesthetics and expression. It is the literary beyond words, both indigenous and vernacular, configured by the archipelago, rantau and tanah air. Celebrated in a 2014 book by Riau cultural historian Tenas Effendy, and titled Rumah: An Ode to the Malay House, emphasised the wisdom of the icon to us moderns in more ways imaginable. In his foreword to Rumah, Datuk Mohammad Nor Khalid (Lat) recalled his childhood days back in the 1950s when they were fond of drawing and making sketches of kampung houses during art class. Now many have left their “rumah” integrated into the zeitgeist of cubism and the Bauhaus, leaving their cultural icon. And that is rapidly disappearing. Popular culture evokes the Malay house — P. Ramlee’s films in the 1950s and 1960s depicted the Malay landscape, and the modern Malay television dramas. And definitely, Lat’s Kampung Boy. Berpenanggah dan bertepian (With sculleries and bathing spaces). Appropriate for the humid equatorial climate, with raised floors and floorboards placed slightly apart to let the ventilation through, the rumah Melayu is a marvel in the organisation of space. The serambi (front terrace) — rarely articulated these days in our daily speech, serves as the transitional interstitial zone between the inside and the outside — a crucial interactive space between the dwellers, the village community and their immediate environment. The preface by architect Ken Yeang describes the rumah Melayu as having such features as a steep pitched roof for the rapid removal of torrential rain, a floor raised above ground with floor boards placed slightly apart to let the ventilation through, and the multi-layered fenestration (comprising an inner layer of curtains for privacy, the balustrade layer for safety and the outer operable louvred windows). Tenas captures both the tangible and the intangible, the silent and the spiritual, as in Rumah ada adatnya, Selilup Bendul Tepi, Selingkup Bendul Tengah (Houses possess their own Adat, Enfolding the Bendul Tepi, Draping the Bentul Tengah). The complexities in the meanings symbolically capture the crafting of the nation, a communal web of mutual obligations. The rumah Melayu is not a Malay “project”, but a national and a regional one. It is Malaysia’s contribution to the worldview and epistemology of architecture. A national consciousness must be present at all levels. It should be evoked in the nation’s public policy on architecture, regulated through the heritage legislation. This is not just aesthetics.